Getting your child to participate in things, especially new physical activities, can be far from an easy endeavor, to say the least. At the end of the day, though, it’s all about how you present the idea to them. For example, let’s say your child abhors even the mere sight of vegetables. If you sneak them into a delicious food that they love — such as a big bowl of mac and cheese — then they will get the benefits from the vegetables without all of the fuss. The same concept can be applied in many ways to your child’s exercise and physical fitness. In order to help your child learn to grow a love for being active, you might have to pull some sneaky strings in a similar fashion. 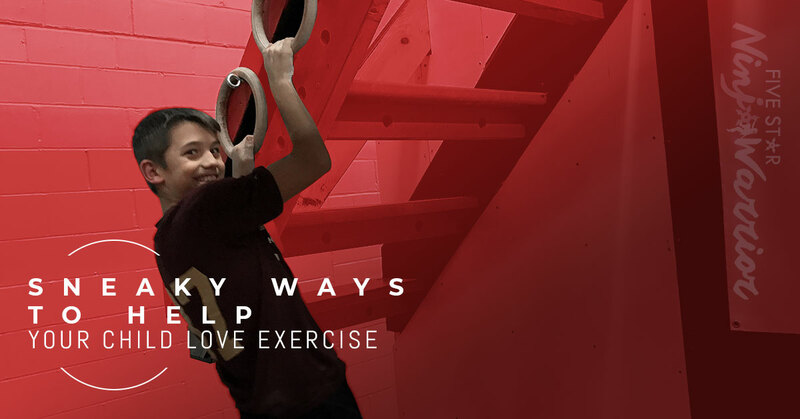 If you’ve been searching for ways in which to motivate your child to live a more active and healthy lifestyle, here at the Five Star Ninja Warrior gym in Minneapolis, we have a few tips for you that just might do the trick. It’s important to remember that your child is reluctant to exercise for many of the same reasons that you once were. With so many other forms of entertainment and engagement at their disposal, they can easily justify sitting on the couch all day and not even stepping foot outside or doing any sort of physical activity. Everything in our society today revolves around engagement, and exercise is no different, which is why these four tips should help you encourage your child to love exercising without even realizing it. Just like you, if your child doesn’t enjoy doing something, then they will be reluctant to do it. This is why it’s always important to have an element of fun in exercise. If your child likes to race, jump, or climb, find ways to implement these activities into their daily lives, which leads to our next tip. What does your child enjoy doing? Have you caught them dancing to music? Do they love video games? Are they obsessed with dinosaurs or pirates? Play into their interests for fitness. When your child actually enjoys what he or she is doing, then they will be more willing to make it a habit. At Five Star Ninja Warrior, we offer an array of kids fitness programs that play into their different interests and give them a great way to let out their energy and exercise without even knowing that’s what they’re doing. What’s neat about our ninja warrior gym is that it’s different from traditional kids fitness programs you’ll find at your standard gym. Ninja warrior gyms allow your child the freedom to exercise in their own way that they find most fun. In fact, after coming for one class in our ninja warrior gym, most kids end up coming back with all their friends for a ninja warrior birthday party! Which leads to our final tip. One of the biggest keys to staying active as a child is having a great group of friends to be active with! From “The Sandlot” to “The Little Rascals,” there are countless timeless examples of how children get out and enjoy more physical activities when they have friends to enjoy them with. Aren’t you normally more motivated to go to the gym when you are meeting a friend to take a fitness class or train together? The same applies to your child. If your child’s main friends are online over a headset, no need to fret. Consider letting them try a day in a junior ninja class at a ninja warrior gym like ours in Minneapolis. They’re guaranteed to make new friends and have a blast while (sneakily) getting their exercise.